Games of all kinds have the power to improve people’s lives.” While Adam Davis and Adam Johns were brainstorming for a presentation at PAX South in 2016 they filled an entire whiteboard with reasons why tabletop role-playing games are inherently beneficial. Last year, Game to Grow started with that in mind, implementing weekly therapeutic social skills groups to help young people become more confident, creative, and socially capable. The founders use their experience in couple and family therapy, drama therapy, and education to promote social growth among youth in a fun, safe environment. What was the catalyst the brought about Game to Grow? Game to Grow was founded after about seven years of using RPGs to help teens and adolescents build social skills. I (Adam Davis) began in 2011, while in grad school. I took over an evening rpg-based gaming group for kids struggling socially, and saw the amazing potential of RPGs to improve social skills outcomes. When I took over the group, it was mostly just a place where quirky kids could congregate. As I was studying drama therapy in graduate school, I realized D&D has the potential to be sit-down drama therapy, and began implementing some of my training into the facilitation. I brought Adam Johns into the work in 2012, and we left to found Wheelhouse Workshop in 2013. After four years or so of running Wheelhouse Workshop, we were up to serving nearly 40 kids per week, and had expanded to five groups across the greater Seattle area. We wanted to spread even more, however, and figured founding Game to Grow as a 501c3 nonprofit was the best way to do so. 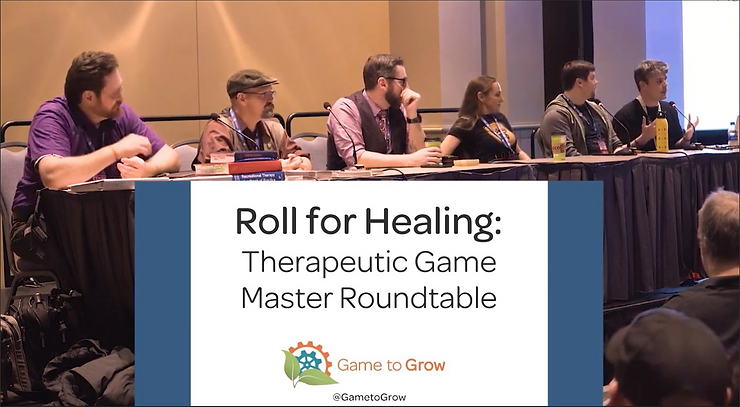 We want to take RPGs into hospitals, schools, and community centers, and not only serve youth but also use games of all kinds to help veterans, incarcerated populations, and even the elderly. Being a nonprofit positions us nicely to serve the community at large. How do you help the community? We specifically use RPGs to help teens, adolescents, and emerging adults build confidence, explore and expand their social skills repertoire, and help them build relationships that extend outside of the game table. Why do you think gaming and community service is a good fit? As it says on the front page of our website, “Gaming brings us together.” Games have the power to improve people’s lives, and even more so if those games are played with intention, and that capacity for improvement can be maximized when facilitated by a trained professional. Imagine that playing a game is like going to the gym. Having the help of a trainer improves outcomes, and going to a physical therapist provides a maximum potential because they understand the inner workings of the body and how to provide it the specific support it needs to heal and thrive. How have people been receptive to the idea? All in all, people have been overwhelmingly supportive of our work. We’ve spoken around the country over 20 times about our work at various conferences, conventions, and workshops, and the response has been very positive. What RPGs have you used for therapy? No Thank you Evil!, Microscope, Fate Accelerated, Dungeon World, TryDice (a game we developed ourselves). What do you think is the biggest take-away for participants? It’s so dependent on the participants! Everyone gets the opportunity to have rewarding social experiences, which reduce isolation and depression. Everyone has a surge of new meaning in their lives as they join a team of their peers to work together toward a common goal. They develop a community of peers, sometimes for the first time in their lives, where their participation is valued. Some participants achieve more in terms of perspective-taking, delay of gratification, or confidence boosting, depending on what their lives are like before they join, but every participant has the opportunity to feel the magical feeling of being wanted. Many of our participants struggle with social isolation. Sometimes related to diagnoses of autism, ADHD, anxiety or depression, and sometimes just because they are having trouble making friends at school or in the community. Our gaming groups help provide them an opportunity to connect with their peers in a safe, fun, and prosocial context. Many participants have been in some form of social skills instruction program, but haven’t yet felt the benefit of actually being social. A gaming group helps provide an intrinsic motivation for being social with others—the game itself is more fun and more rewarding when players exhibit prosocial behaviors, so the reinforcements are immediate and genuine. We’ve had some participants come into the group having never really had a friend or a community, and through playing role-playing games build real relationships. We had some participants move in together as roommates as they began their freshman year of college. Playing together helped them build trust and independence. What advice would you give folks wanting to start similar programs? Don’t give up. When we first started, we had to weather the barrage of low expectations placed on us by others—people who thought there was no way playing Dungeons and Dragons could actually help people. There were many times we could have given up over the years, when we were working 13+ hour days with side jobs. It took time to prove to the community that the work is valuable and can have a powerful impact in the lives of participants. It may be the same for others just starting out. Remember that it often does take work to create a life full of play, but it’s worth it. Our full (I think mostly up to date) list of speaking engagements/interviews is on the page on our website. You can follow Game to Grow on Facebook and Twitter. You can also contact them directly about their programming or about engagements.